BBC Sport has launched a new-look mobile browser site which has been tailored to work across the growing range of mobile devices. The site uses the latest responsive design technology so it automatically scales to fit different sized screens. Also featuring easy-to-use navigation, it includes users' favourite links. There are new live scores and football fixtures, results, tables and live pages for every Premier League game, as well as a host of other new features. This initial release focuses on the site's most popular sports. The rest of the site will be updated in early 2013. The site will continue to be upgraded over the next 12 months, and BBC Sport will also introduce an app early in the new year. A growing proportion of the BBC Sport audience arrives via mobile devices - with larger traffic spikes around live sport such as football - and up to two million people a day accessing via a mobile device at weekends. 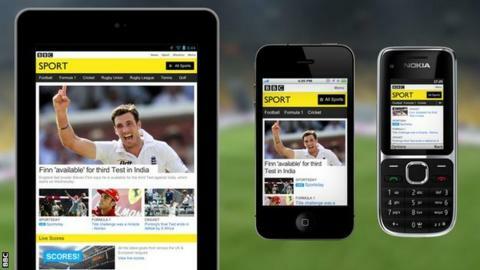 "On this new responsive mobile sport site all devices get the same range of stories, indexes and sport statistics, but the layout changes," writes Lucie McLean, executive product manager for BBC Future Media, in a BBC blog. "We hope you enjoy the new features and welcome your feedback on how the site looks and works on your mobile device." To access the new site on a mobile browser visit m.bbc.co.uk/sport.